Democrats are again pulling out from their rhetorical basement accusations that Republicans are waging a “war on women”. Meanwhile, they’re ignoring another war that’s real, the “war on our children” that government spending addicts are prosecuting. 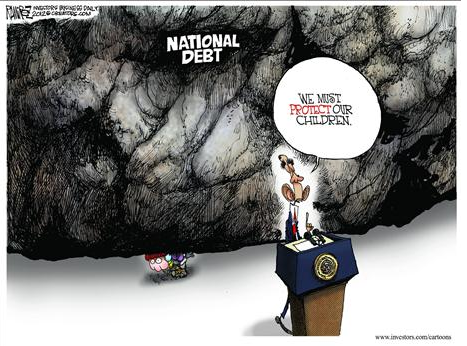 Our children are going to pay a heavy price for the fiscal insanity that has already led to national debt in excess of $17 billion. The increase in our national debt over the past 25 years. years has been mind-boggling. In 1990, it was $3.2 billion, in 2000 $5.7 billion. By 2010 it was $13.6 billion. Now it has leaped to $17.5 billion. But Democrats, in the spirit of “see no evil”, want to keep the issue under wraps and focus on other things. During a February 2014 House Financial Services Committee hearing, Rep. Maxine Waters (D-CA) and Rep. Keith Ellison (D-MN) even complained about two real-time running national debt clock displays in the hearing room. Ellison said it was just intended to send an ideological message. Obama says his FY2015 budget proposal is an “opportunity agenda”. Yes, an opportunity for $564 billion more debt, an opportunity to increase total national debt to nearly $25 trillion over the next 10 years and an opportunity to pander to Americans who want it all without paying for it. Some Democrats are arguing that annual deficits are dropping, so we can all back off worrying about the problem. But the most recent Congressional Budget Office (CBO) budget forecast projects that after a few years of lower deficits they’ll climb again for an indefinite period. In addition, the national debt will increase annually by much more than the amount of the deficit because a considerable amount of federal borrowing is not counted in the budget. As a result, the CBO projects $7.9 trillion will be added to the nation’s cumulative public debt over the next decade. That’s because revenue will keep up with economic growth, but spending will grow even more. “Spending is boosted by the aging of the population, the expansion of federal subsidies for health insurance, rising health care costs per beneficiary, and mounting interest costs on federal debt,” the CBO said. According to the CBO, interest payments will soon become the third largest item in the federal budget, after Social Security and Medicare. Right now, interest on the debt costs $233 billion. CBO projects that interest costs will reach $880 billion by 2024. As interest costs grow, they could crowd out investment in other priorities, including education, research and development, and other programs that could help our economy grow. Large and growing federal debt that restrains economic growth will give policymakers less flexibility to respond to unexpected challenges, and eventually increase the risk of a fiscal crisis. A Peter G. Peterson Foundation survey released on March 25, 2014 concluded that 67 percent of people say their concern about the national debt has increased over the past few years and 79 percent say that addressing the national debt should be among the President and Congress’ top 3 priorities. And yet, Democrats continue to resist deficit-lowering efforts. Deficit reduction surged as a policy priority during Obama’s first term: Between 2009 and 2013, the share citing the deficit as a top priority rose 19 points, according to a January 2014 report from the Pew Research Center for the People & the Press. In the most recent 2014 survey, majorities of Republicans (80%) and independents (66%) continued to say reducing the budget deficit should be a top priority for the president and Congress, but just 49% of Democrats viewed it as a top priority, the lowest percentage since Obama took office. Going back 20 years, the gap between Republicans and Democrats on the issue has never been as large as it is today, Pew said. Not exactly a hopeful sign for the emergence of bipartisan cooperation on the issue. This entry was tagged CBO, Congressional Budget Office, deficit, FY2015 budget, Jeff Sessions, Keith Ellison, medicare, national debt, Obama, opportunity agenda, Peter G. Peterson Foundation, Pew Research Center, social security, war on children Maxine Waters, war on women. Bookmark the permalink.